This concrete residence comes from SPBR Architects and is located in Santa Teresa, Rio de Janeiro, Brazil. At a first glance, one can only feel overwhelmed by this imposing building, situated on a hill top. 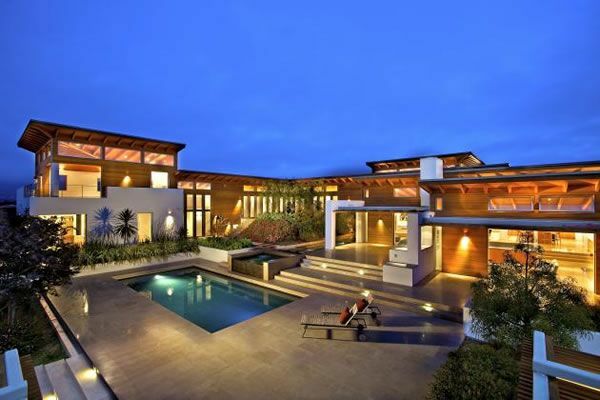 Here is a description from the architects concerning this home’s structure: At the lower level, there is a linear block that leads to the bedrooms and the office. Their main glass facade opens up to the enjoying garden on the east side. The roof was designed to make a complementary ground on the upper plateau. The living room is located over the higher plateau providing a view of downtown on the north side and of the Guanabara Bay and Pão de Açucar on the south. This volume is closed on the east and west sides to avoid sun heat and to emphasize the magnificent views on the other sides. It leaves the level below completely open. Thus, there is a bare level between bedrooms and living room which is filled by the kitchen, where, according to the traditional Brazilian culture, most people will spend their spare time. What is your personal opinion on this design? Do you believe this type of residence could provide an appealing living environment?